The Trans-Taiga Road is a gravel road that runs 666 km east from near the top end of the James Bay Road. It was built to access the various dams and generating stations that extend upriver along the La Grande River. This is an extremely remote road, leading 666 km east - almost to Labrador - with no settlements or towns aside from Hydro Quebec's settlements for workers (not open to the public). At the far end you will be 745 km from the nearest town! This is the farthest you can get from a town on a road in North America! (Not counting the private Hydro Quebec towns that are not open to the public). Along this road is also the farthest north point you can travel on a road in eastern Canada. 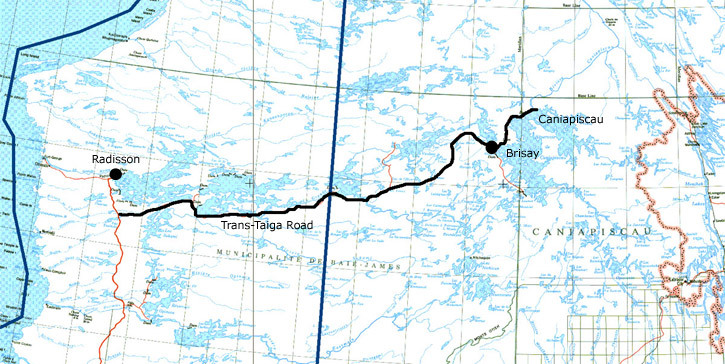 The road from Brisay (km 582) to Caniapiscau is rougher and a 4-wheel drive vehicle is recommended by Hydro Quebec. The main reason for this is the very coarse gravel used for this road - there's large rocks littering the road surface. However, I have heard from people who have driven this road in ordinary passenger cars and they say it is fine. You do have to keep your eyes open for the larger rocks though. You should definitely travel this road only in a reliable vehicle with good tires. It is not an overly rough road; passenger vehicles can drive it, but it is gravel. Vehicle breakdowns here can be very costly. Flat tires can be a serious (and expensive) incident if your tires are damaged. You could be looking at having tires flown in on a non-scheduled flight - there are no convenient "tire stores" up here! Please read Driving the Trans-Taiga Road first. Although there are no towns, there are a couple of outfitters along the way that sell fuel and offer meals and lodging. Cell phones do not work here. Generally the scenery is fairly level, but this road is definitely more interesting than the James Bay Road. For most of the length it runs through taiga: spruce and jack pine forest, bogs, rocks, and low hills. This is about all you'll see apart from birds and some wildlife, the occasional cabin a short distance off the road, and Hydro Quebec installations. I once saw a couple of wolves playing in the middle of this road. This truly is a *VERY* remote road. Do not approach a trip along it lightly. Please read Driving the Trans-Taiga Road before traveling this road. Detailed Travel Guide to the Trans-Taiga Road - print this out and take it with you on your trip. Brisay - info and maps (Brisay is a Hydro Quebec installation at km 582 of this road). Past the End - please read this if you are wondering if it is possible to drive east from the end of the Trans-Taiga Road to Labrador (it's not).